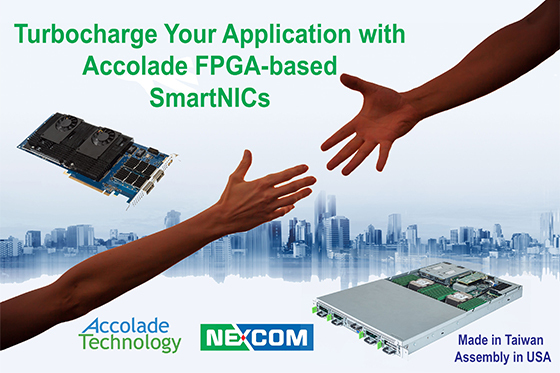 Accolade Technology, the leading provider of advanced host CPU offload adapters(SmartNICs) and NEXCOM International (TWSE:8234), a leader in IPC, network communication and security industries, today jointly announced that the two companies are collaborating to offer server grade appliances pre-bundled with an FPGA-based SmartNIC used for advanced packet capture. The Accolade packet capture SmartNIC will initially be pre-bundled with the NSA 3170HA and NPA7100 appliances with additional appliances added in the future. And, NSA 3170HA and NPA7100 are designed based on Intel® Xeon® Processors feature enhancements that benefit Accolade’s SmartNIC, improvements in I/O, memory & fabric integration. “We are collaborating with Accolade’s SmartNIC to address the market-ready cybersecurity solutions. NEXCOM aims to create optimized, reliable, interoperable solutions, to accelerate the new high-value services to our OEM/ODM partners while saving design time and cost.” said Andrew Huang, Vice President of Global Business Development at NEXCOM. Although the combined appliance is mainly targeted at cybersecurity and network monitoring applications, it is generally useful for any application that must accommodate high rates of lossless packet capture coming from a passive optical TAP, switch SPAN port or packet broker. Typically, security and network monitoring applications are not able to gracefully handle large volumes of packets (especially at 40 and 100GE levels) without dropping packets or otherwise compromising packet analysis. Customers can choose from an array of SmartNICs with various configurations and interface speeds from 1GbE to 100GbE. The SmartNIC pre-installed in an available PCIe slot as well as a software development kit (SDK). In addition, technical support will be provided to help the customer integrate its application to take advantage of the SmartNIC’s various features such as nanosecond precision timestamping, packet filtering, flow classification, flow shunting, deduplication, packet steering and more. With the help of an Accolade SmartNIC, our OEM/ODM partners can rest assured that their application is not losing valuable information or using unnecessary compute power that could be better applied to other tasks. The pre-bundled appliances are ready for sale now and can be ordered directly from NEXCOM or affiliated partners. Accolade Technology provides the most technologically advanced, lossless packet capture, application acceleration and host CPU offload adapters/SmartNICs available in the market. Accolade’s 1-100GE ANIC FPGA-based adapters help accelerate cybersecurity, network monitoring and other applications developed by the world’s leading networking companies. Accolade’s OEM customers offer products for network security and monitoring, flow classification, deep packet inspection, network test and measurement, video stream monitoring, and more. Each ANIC adapter comes standard with FPGA intellectual property designed by Accolade engineers for host CPU offload functions such as nanosecond precision timestamping, packet filtering, flow classification, flow shunting, deduplication, packet steering and more.